Hard to believe this one's now over a quarter century old. There seems to be a divide on it between those who read Michael Ende's book and would have preferred a more direct adaptation, and those who didn't or did but feel the adaptation was at the very least adequate enough. I fall into the latter category; for the story they wished to tell, it flowed and arced quite nicely (and since both halves of the book have somewhat different tones, it did make some sense to split it up. I do like the film's message too, that, essentially, a world without fantasy is a world really not worth living in, that we all need a little magic in our lives to keep the world going round. I'm sure many here would agree that the special effects are still fabulous all these years later--in many ways even more so than many modern films, with the quaintness in a way making them more realistic. And it goes without saying Limahl's theme is one of the best of the decade, and magical in its own right (even if only we in North America got to hear it). I agree with everything you said. I never read the book, but I've loved the movie since I was a kid. My favorite parts are Rockbiter's strong hands speech, when Atreyu is saved from the swamp, and the final scene where Bastian rides Falkor. They always move me. I saw this in the theaters when it first came out and still love it to this day! There seems to be a divide on it between those who read Michael Ende's book and would have preferred a more direct adaptation, and those who didn't or did but feel the adaptation was at the very least adequate enough. Similar to the Dune debate in another thread. I tried to read the book several times but never got far. I'd be interested to know what people thought of the book. And it goes without saying Limahl's theme is one of the best of the decade, and magical in its own right (even if only we in North America got to hear it). How much credit to Giorgio and how much to Limahl? It was also at the start of the UK version of the film. I'm fairly sure that it was released as a single in Europe even though it wasn't on the titles of the movie. My favorite parts are Rockbiter's strong hands speech, when Atreyu is saved from the swamp, and the final scene where Bastian rides Falkor. They always move me. It's a seriously powerful movie, I don't know many 'kids/fantasy' movies that have this level of emotional depth. In fact it's probably more of an adults movie. It's brilliant on so many levels. I think I'm gonna buy it on blu ray... I'm ready!!! Watched this one with my son last summer. It´s still a good movie. I read the book when i was young and loved it. I remember that it was printed with red and green letters. Only the German version didn´t include the Moroder/Forsey/Limahl tune. I read the book when i was young and loved it. I remember that it was printed with red and green letters. The hardback was, not so sure about paperback editions. Nice touch. The book was really big in Europe wasn't it? For some reason it never seemed to catch on here. I've just started reading it because of this thread, and there is definitely something 'off' about the translation. It feels like it might be too literal a translation. You can't just take German and make it English without things losing meaning, everything must be re-phrased. I'm finding as I read it that I'm re-writing it in my head to make it 'fit' better. Never a good sign. Doesn't help that I'm far older than the intended demographic! I've always loved this movie it's one of those I can place myself where I was almost every time I watched it. I bought the dvd not long ago....I really should watch it again. Indeed, judging by many YouTube comments, you'd be surprised how many people who back in the day were unfamiliar with Kajagoogoo thought the song was performed by an African-American woman. The German version contains some different scenes and is longer. The author hated the movie version. You never watched the credits?! Tsk! Probably too busy singing; "TURN AROUND... LOOK AT WHAT YOU SEEEE EEEEEE EEEEEE EEEE "
To be fair, the chorus is sung by Limahl and a woman, and the song itself is a kind of duet between a male and female vocalist. I think when I first saw the film I thought the song was sung by a woman too. 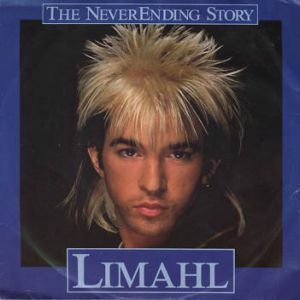 "The NeverEnding Story" is sung by Limahl in accompaniment with Beth Anderson. Here is a film clip. Just downloaded this entire soundtrack....awesome. I can't get enough of the title song. Why is every comment on Youtube flagged as spam?! LOL yeah this conversation sounds a little familiar logan. We know the answer to this mate!! This movie was close to the first of its kind. Meaning cinematography taking a completely new direction... also, one of the first big blockbusters on screen world wide (exception of Bugsy Malone) which had children actors playing roles which in todays epics would be brad pit and angelina jolie...feel free to put me in my place and disagree so long as you can back it up (Logan your expected to). It demanded you to challenge yourself into figuring out how the hell they have done this. Pure genious and i really think this film does not get the credit it deserves. I run a film club at the school i work in and have played this movie twice to the 11 yr olds...the looks on children's faces says it all...the sheer look of despair and terror and shock on childrens faces when the horse is sinking and being screamed at to move is just so overwelming for some of them. The wolf absolutely terrifies them beyond anything they have seen...love this movie. Interesting thing; in the book the horse can talk, he sinks into the swamps out of sadness (obviously) but Atreyu doesn't feel it because he's wearing the Auryn. In the making of documentary (now complete with text translation on Youtube!) you can see the scene with Artax being shot. Tricky stuff! Nowadays; CGI. TNS is a great fantasy film - good creature effects for the time, and great plot. I especially liked all of the weird/horrific creatures in the throne room sequence near the beginning of the film - I wish we had seen more of these creatures in the rest of the film. The book is really depressing and so different, as far as I can remember, that it and the film stand on their own as separate stories. The movie stops about 1/3 of the way through the book.